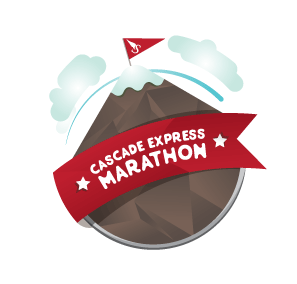 General Info: The Marathons of the Cascade Super Series begin at the Hyak Lot at Snoqualmie Pass, WA, with the marathons ending at the Cedar Falls trailhead in North Bend, WA near Rattlesnake Lake. Please take a look at the race day schedule to ensure a smooth start. There is no early start option and the race will have a seven hour cut-off. The June race beings at 7AM with official timing concluding at 2:00 PM. The September race beings at 8:00 AM with official timing concluding at 3:00 PM. Packet Pick-up: Packet pickup will be available on race morning from 6:30AM to 7:45AM. PHOTO ID IS REQUIRED FOR PACKET PICK-UP! The race will have parking near the start line. Since this is a point to point course we will provide shuttle buses from the finish to the parking area. Runner parking will be at two lots at the Summit East Ski Area. The closest lot will be used first and overflow parking will go to the second lot. It is a 0.75 mile walk to the start line area from both lots. From I-90 West: Take exit 54 toward Gold Cr./Hyak, Turn right onto Washington 906 then continue straight onto Hyak Drive East. Follow signs for designated parking. From I-90 East: Take exit 54 toward Hyak Gold Cr, Turn left onto Washington 906 then continue straight onto Hyak Drive East. Follow signs for designated parking. From Summit Inn (Host Hotel): Head south on Washington 906 for 1.8 miles, then turn right onto Hyak Drive East. Follow signs for designated parking. Runners with a Discover Pass may choose to park at the Hyak Parking Lot where the race starts. Runners without a Discover Pass can also park here however they must pay the $10 day use fee. Drop Bags: We will provide each runner with a drawstring fabric drop bag! Drop bag tags are provided with your bib. You can drop your bag at the start and we will shuttle it to the finish line. Course Info: Info on our course is available here. Directions to Finish: From Seattle, proceed east on I-90. Take exit 32, making a right on 436th Ave, which becomes Cedar Falls Road SE. Pass the Rattlesnake Lake parking area, coming to the entrance and parking area for the Cedar Falls trailhead 3.0 miles from exit 32. The entrance will be on your left. From Snoqualmie Pass, proceed west on I-90. Take exit 32, making a left on 436th Ave, which becomes Cedar Falls Road SE. Pass the Rattlesnake Lake parking area, coming to the entrance and parking area for Iron Horse State Park 3.0 miles from exit 32. The entrance will be on your left.